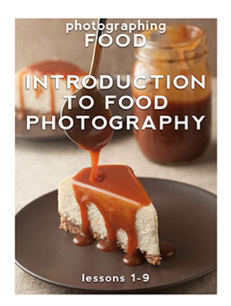 This week, I am teaching a food photography class at The Light Factory in Charlotte, NC. The class will cover everything you have seen in my photo tutorials and much much more. Next week, I will provide a recap of what the class was like. Anyway, in preparing for the class, I was putting together some slides on shutter speed, so I thought I would share a little what I am covering with you. 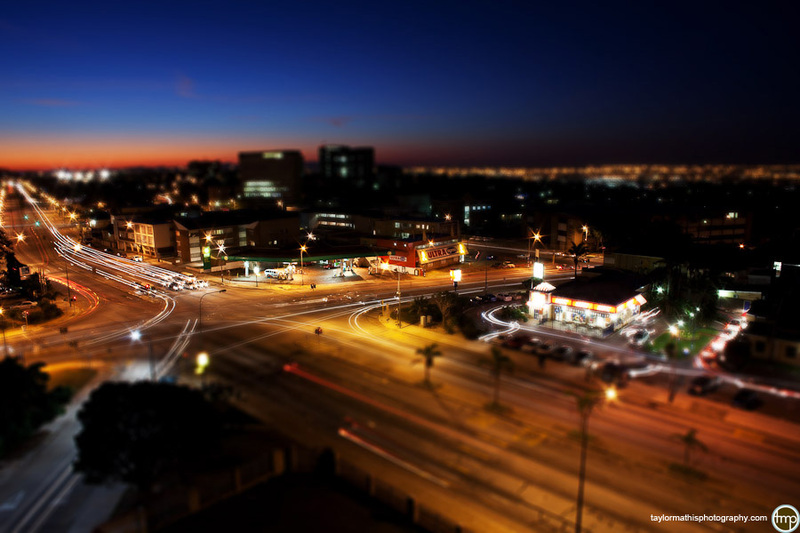 Shutter speed is a crucial element to the outcome of your picture. It is the opening and closing of the camera’s shutter and determines the length of the exposure. It is one half of the exposure equation. Unfortunately, the other half (aperture) is often seen as the creative side. Well this is just not true. You can become incredibly creative with shutter speed. All you need to know is how to use it. Have you ever seen an image like this one? It is called a light trail. This is a very common way to play with shutter speed. By leaving the shutter open for a long time (1,3, 5 seconds or longer), the car’s headlights will create a streaking pattern. At busy intersections, you can get really creative. It is measured in fractions of a second. On your camera you may see 1oo, but that means 1/100th of a second. Only the denominator of the fraction is shown. Shutter speed is used to show or freeze movement. When it comes to food, you might be wondering, why would I need to freeze or show movement when my cupcake just sits on the plate? (if your cupcake walks around your plate, you have bigger problems on your hands) With food, it isn’t the movement of the food we want to show, its the process of the food being made. 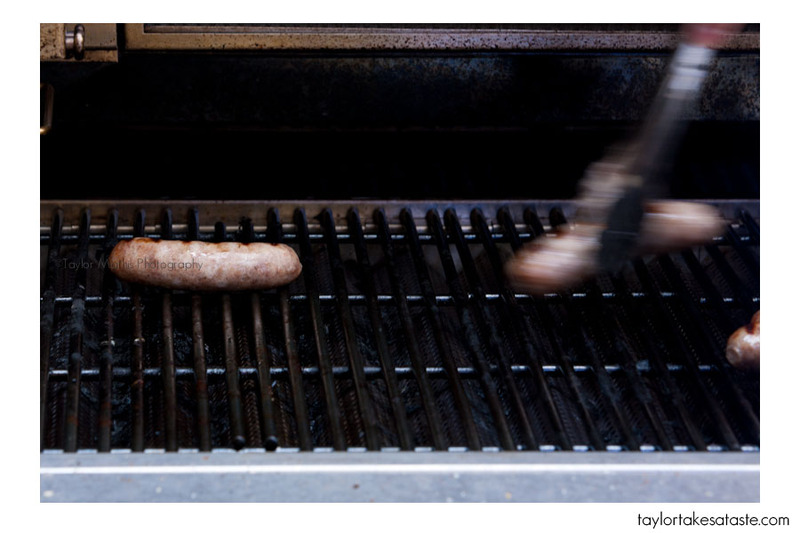 For example, lets look at grilling brats. 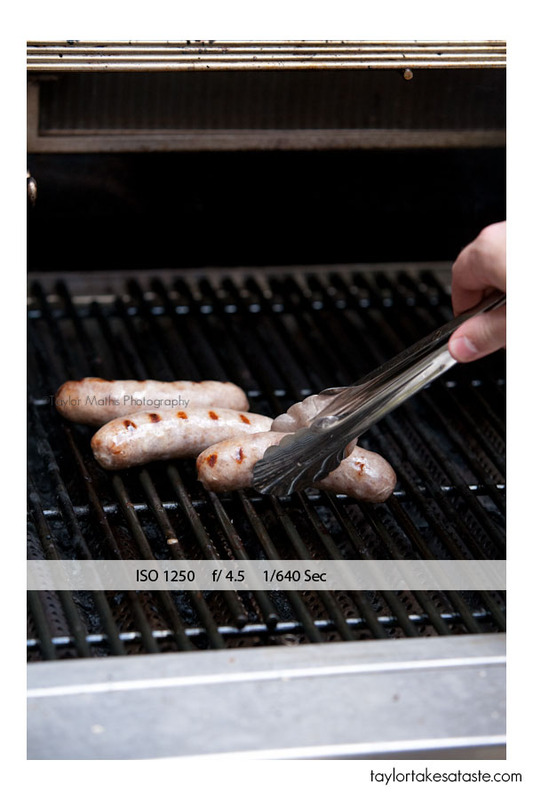 Notice how the brat in the tongs is kind of blurry. Look closer, this isn’t an out of focus blur, it’s a motion blur. You can tell that the brat is being moved to the right. This was done by using a slower shutter speed. Ok, here is our first image. Notice how the brat’s movement is frozen. Look at the shutter speed. 1/640 of a second. That means that moving at this speed, the camera’s shutter would open and shut in .00156 seconds. That’s pretty fast! This also means, that the camera’s sensor was only exposed to light for 1/640 of a second. My brother (the brat holder, don’t worry I paid him in food) is fast, but not 1/640 fast. Now if we wanted to show the motion of him moving the brat we would use a shutter speed that is longer. In this image, the camera’s shutter speed is 1/60. This means that the camera’s shutter opens and closes om .016 seconds. That is still pretty quick, but not quick enough to freeze the brat in place. 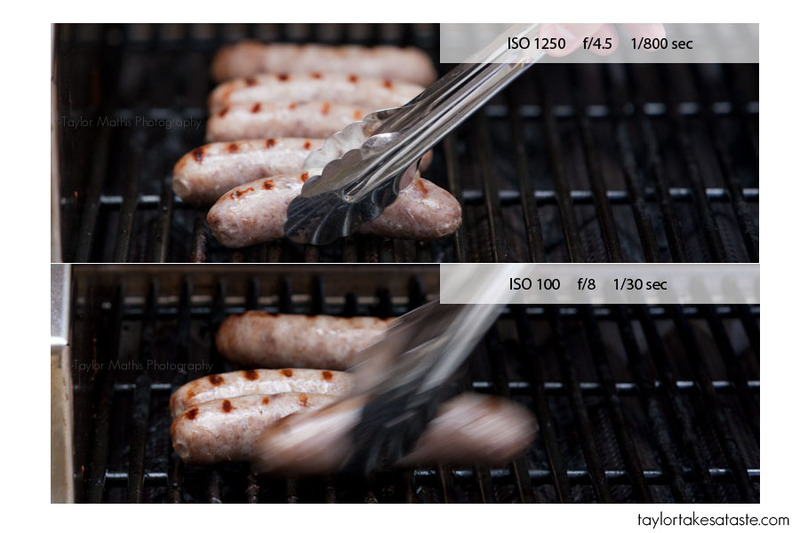 You can tell this is movement and not out of focus because all the still components of the image (other brats, grill grates) are sharp and the motion blur on the brat with tongs. Lets look at an example side by side. Notice the difference in shutter speeds. The image on the left was taken at 1/1600 or .000625 seconds. This leaves the brat frozen and in sharp focus. 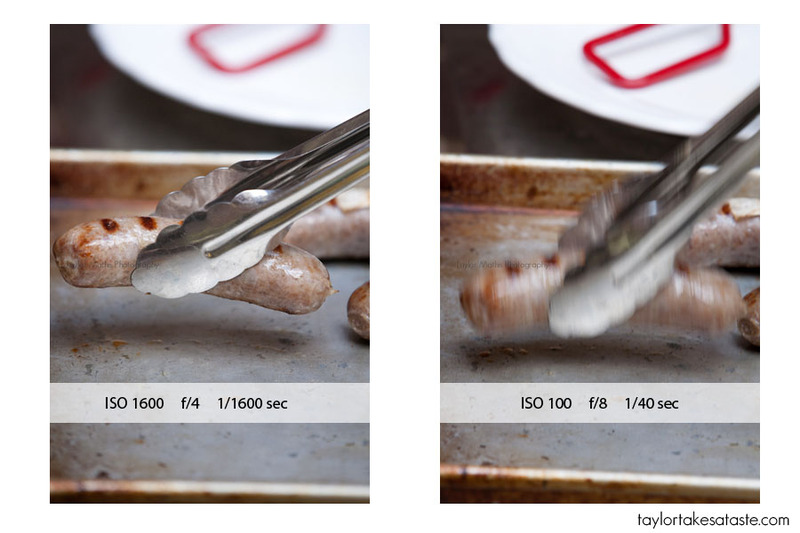 The image on the right was shot at 1/40 or .025 seconds, leaving the brat with a nice motion blur. Lets look at one more image. The top has a shutter speed of 1/800. This leaves the brat’s movement frozen. The bottom shows a nice motion blur with a shutter speed of 1/800 of a second. Lets recap. To show motion of a moving object, you use a slow shutter speed. To freeze a moving object, you would use a fast shutter speed. So back to the previous question of what is fast and what is slow? Unfortunately, that is not a cut and dry answer. It all depends on how fast your object is moving. If you are trying to freeze the motion of a food processor blade it is going to be much different than freezing the motion of a pasta being dropped into water. Remember the shutter speed scale? When I am hand holding, I don’t like to shoot at anything slower than 1/100th of a second, that changes with the lens I am using, and If I can brace myself on something, but as a general rule, I try and shoot faster than 1/100th when shooting a still object and I am worried about myself causing camera shake. If you are trying to freeze an object, I would start at 1/250th and faster to ensure you freeze the image sharp. To show motion, I would start at 1/80th of a second and slower. The slower the shutter, the more movement you will see (assuming object’s speed is constant). With a slower shutter speed be careful of camera shake and make sure you have the image in focus. The movement will be more powerful looking if it is blurry and the rest of the scene is sharp. Remember, these are just guideline to what I do. What works best for you and your set up may be different, so experiment and play around. If you have never played around with shutter speed, I suggest you do! 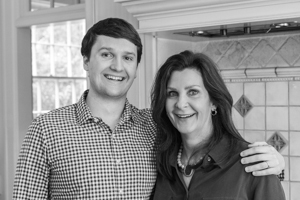 Okay… so here is the dumb question from a novice photog… where on earth do I change the shutter speed? Yikes! That’s been one thing that I’ve always had on manual… and I get a ton of camera shake with anything other than my tripod. Help? Great post as always Taylor! 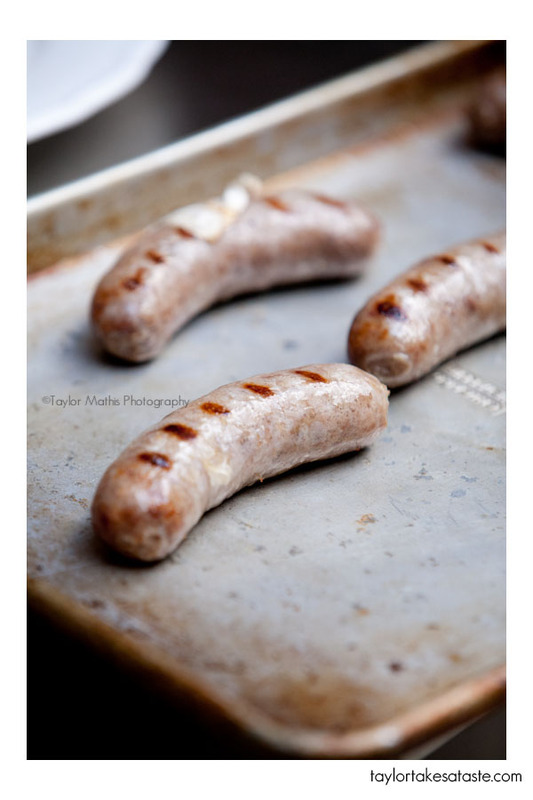 Very useful food photography post! I really like the shutter speed scale you provided–before I knew I could increase/decrease exposure, I used to adjust the aperture according to the shutter speed–such a blurry mess! Thanks! So glad you found this useful! I prefer to decide on my aperture and then adjust the shutter speed that is necessary. Okay… I’ll f/u one dumb question with another one. From what I can tell, you can’t control both aperture AND shutter speed at the same time on my camera. Does that sound right? There are no dumb questions! I would need to know what your camera is, but on DSLRS if you are shooting in Manual mode, you have control over both the aperture and the shutter speed at the same time. I would love it if you posted more photos with the settings you use. That to me is really interesting and a solid way that I can try to replicate. Marci, For this set up there was no lighting set up. 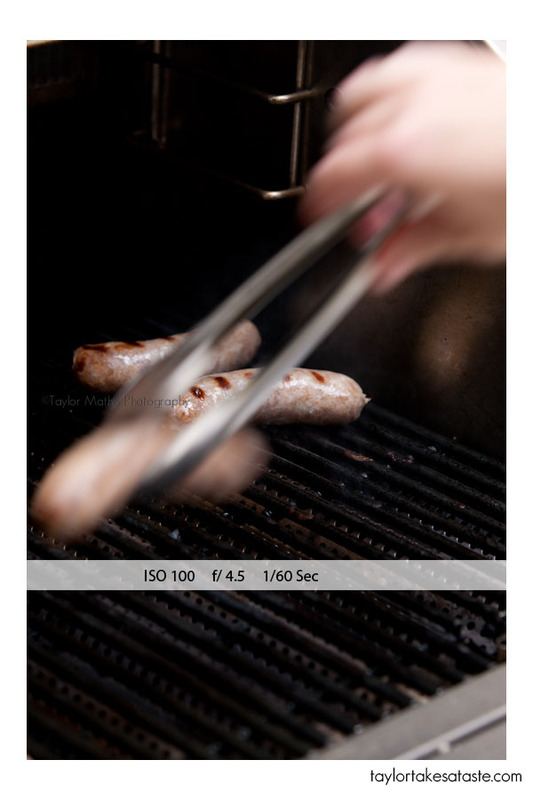 I was just photographing the grill outside. In the future I can include more lighting sets ups.